He is the young man who watched over the coats of those involved in the stoning of righteous Stephen, a messenger of the gospel to the Jewish people, consenting to his death. Saul Goes Hunting For Believers. 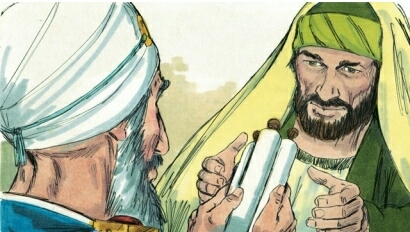 Like most Jewish leaders of his day, he was adamantly opposed to this “Jesus sect,” known to the Jews as “Followers of The Way.” Determiined to stop this “heresy” before it got out of hand, he obtained legal papers from the religious leaders in Jesusalem allowing him to go after these “heretics” outside of town. This pleased them very much. That is why he was on his way to Damascus. But something quite unexpected happened on the way to doing what he thought was the the will of Almighty God. Jesus appeared to him in a light so bright it literally knocked him off his “high horse,” so to speak. Let’s follow the story. He was blind for three days. Imagine how he must have felt when he realized the truth of what he’d been doing! He was actually working against God and against the Messiah Himself! Shaken? You betcha! He was terrified! No wonder his life turned around 180°! 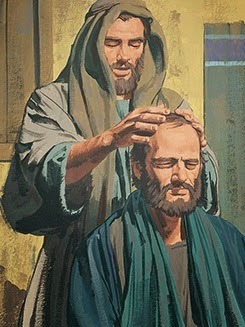 During those three days of blindness, he was given the full-up revelation of the gospel of Grace from our risen and glorified Jesus Himself, seated at the right hand of the Father. It wasn’t given to Peter. It wasn’t given James or even John, men who knew Jesus personally and had walked with Him while he was here on earth. Paul may have missed out on an encounter with Jesus in person but, because of what was revealed to him, he went on to write 3/4 of the New Testament! Incredible! That is, if you think about it, how the whole Bible was written: By revelation. That is how God leads and teaches us today: By revelation from His word! His word is living! You can read one passage in scripture and today it speaks to you one way. Later on, you can read the same passage and it says something different. This isn’t just any old novel that, once you read it, it is read. It is something alive! No other book on the planet is like it! NONE!!! 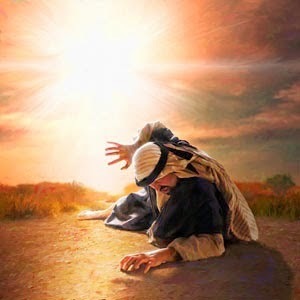 Saul’s companions did not know what what was happening. They were terrified! So, they took him by the hand and led him the rest of the way to Damascus. 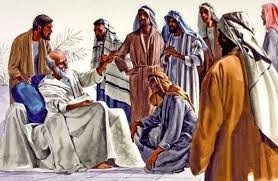 Just as Jesus instructed Saul, they brought him to the house of a man named, “Ananias.” Good thing he was given advanced notice of his “guest’s” arrival or he would have been terrified. Saul’s reputation had spread far and wide. Paul’s murderous intent toward Christians was known far beyond Jerusalem. But God had spoken to him in a dream. As the Holy Spirit directed, Ananias laid his hands on Saul in Jesus’ name. Immediately, his eyes, both physical and spiritual, were opened! Our Abba loves to hide wonderful truths for us in the meanings of people, places, things and even numbers. After these things, Saul became the greatest Apostle of all time: Paul. Any time you find a name change in the Bible, there is a hidden meaning there. Such is the case with Paul. Saul comes from the root word, “Sha’al,” which means, “To ask, beg, or plead.” Paul means, “Humble.” God give GRACE to the HUMBLE,” but resists the proud. You don’t have to beg for what He freely gives. Isn’t God cool? GRACE opened his eyes; the first thing he saw was GRACE. Afterward, he was able to walk straight! WOOHOO! He went from begging from God to a man so humble he received grace upon grace. Nope. There are no insignificant details in the Bible. 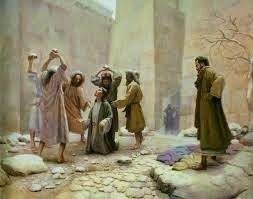 But Saul is also a picture of the Jewish people who have been blind to the gospel since Jesus walked this earth. By God’s reckoning of time, Jesus was here 3 days ago. (See 2 Peter 3:8). They left their homeland (Damascus is in Syria) and out there in the Gentile lands, grace at last opened their eyes! More Jewish people are coming to faith in Jesus than ever before in the history of the world! The Greatest Evangelist Of All Time. From this point forward, Paul became the greatest evangelist of all time! That is so like our God, isn’t it? He takes the most contrary, obstinate, unlikely person in the world, totally transforms them, and uses them for His purposes. He truly is the God of the “impossible!” That gives us all hope! The New Hidden In The Old. 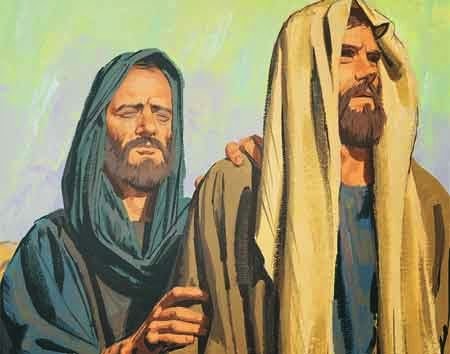 This particular part of Paul’s life is hidden in the Old Testament in the most surprising place: Jacob’s blessing over Benjamin. What do wolves eat? SHEEP. Paul was the “Wolf” who went after God’s “Sheep,” devouring all he could in his early life. But after his conversion on the Damascus road, he got all that revelation (the spoils) and they have been shared around the world for 2,000 years. What a blessing! Care to guess from which tribe Paul is from? Yep, BENJAMIN! Who would have thought that in this long-ago blessing from Genesis 49 you would find a prophecy about the story of Saul, who became “Paul,” and Ananias, who opened his eyes.